1. The world’s migrant population was over 240 million as of 2015. 2. Thai workers abroad sent home a total of 112,997 million Baht in 2016. 3. The highest number of authorized Thai migrant workers are in Taiwan, and most of them work in manufacturing. 4. In the first five months of 2016, Thai migrants in Taiwan sent home a total of 3.6 billion Baht. Small art objects that together make up exhibition อยากกลับไปแต่ใจกลับมา function as a representative of data and are the result from Tanaphon Inthong and Yingyond Yenakarn’s residency at Taichung ASEAN Square Cultural Exchange Project in collaboration with 1095 Culture Studio. During their first time in Taiwan, for 3 months, Inthong and Yenakarn integrated themselves into the Oversea Thai worker community in Taichung, Miaoli, and Donghai. The two artists used observation, conversation, and empathy as their primary art techniques. They joined Thai workers in Taiwan and participated in their daily routines, chitchatted over LEO beers, visited their homes and companies, and went fishing and bamboo shoot picking on their days off. All of these collected stories would later serve as the narratives for this art project. The pair collected found objects from Taichung. Most of them, such as a broken tile from a train station, are parts of the city construction. These ordinary objects that were simply found on the streets, were then painted, refurbished, and installed as art that depict the stories of the brothers and sisters met in Taiwan. The exhibition implicitly presents these objects as memorabilia and relics, and their small to tiny sizes, hint on the migrants’ privacy and private space, their rank in society, and the convenience of moving and migrating. 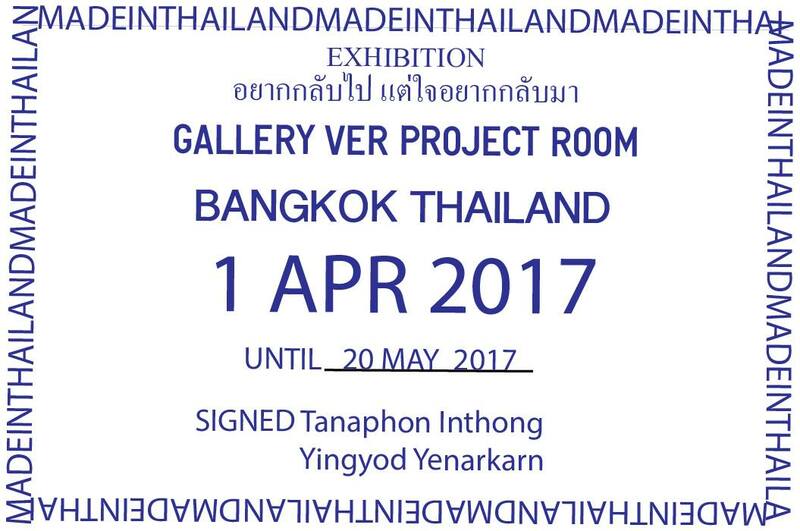 Though these works were previously shown in the exhibition of the same name in Taiwan, bringing it back to Thailand continues and completes the unfinished process, returning home the personal stories that are almost lost by the distance across the ocean. Not only does the exhibition take us to see in small details the daily life of the often overlooked Thai workers overseas, but it also presents the characteristics of humans in the hybrid culture of migrant workers in globalized society that is becoming more and more fluid. The stories of Inthong and Yenakarn’s worker brothers and sisters embodies the in-between state—being on both two poles of Thai-Taiwanese culture, or being in neither of them but synthesizing a new culture based on circumstances encountered. What Thai worker P Nhoo said, “wherever you are, you’re still a human,” was indeed a critique, an appeal, a reflection, and a declaration of pride within the “Oversea Thai workers” label, which genuinely addresses the confusions of identity of migrant workers in today’s globalized world. “80 YEAR 2475”: Don’t talk the Truth of an Uncertainly Dream.